The 368-room Westin Perth is helping spawn new tourism infrastructure around the city. 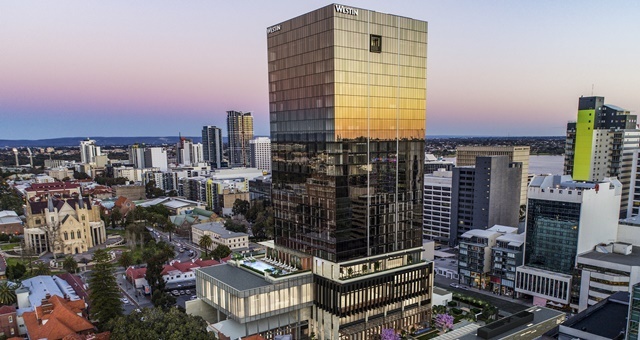 Less than a year after opening, the Westin Perth has changed hands after Malaysia’s YTL Group taking possession of the building for an undisclosed sum understood to be north of $200 million. Brokered by JLL Hotels & Hospitality, the deal marks a sizeable kickoff to the 2019 hotel real estate transaction market following an AUD$1.8 billion year in 2018. The deal is also the largest seen in Perth’s hotel market. The 28-storey asset is the latest Marriott-managed hotel to join the YTL stable following the group’s $415 million purchase in 2012 of Marriott-brand hotels in Sydney, Melbourne and Brisbane. Closer to home, the group also owns the JW Marriott Kuala Lumpur and the Ritz-Carlton Kuala Lumpur. Westin Perth consists of 368 rooms and is located to the east of the Perth CBD. The hotel features its signature restaurant, Garum, the CBD’s largest ballroom and also offers guests an outdoor swimming pool, fitness centre, the Bodhi J spa facility and a number of street-level retailers. Nearby attractions and facilities include the Perth Exhibition & Convention Centre and Hay Street Mall. The city is in the midst of an urban sprawl, generating multiple new attractions and public services in the coming years. These include the Perth City Link Railway, Western Australian Museum and Elizabeth Quay. Such projects come following a $2.5 billion expansion and modernization of Perth Airport to cater for more flights and a higher level of annual passenger traffic. The Westin Perth has performed strongly since its April 2018 opening, exceeding its budgeted performance despite competitive market conditions, said JLL Hotels & Hospitality Group Managing Director, Mark Durran. “Given Perth’s positive future market outlook over the longer-term, major investors are currently seeking quality hotel investments to position themselves for the future market upswing and the income and capital growth that will ensue,” he added.